The fourth season of Bob’s Burgers concludes this coming Sunday on Fox with the second half of a two-parter, entitled “World Wharf II: The Wharfening.” And, well, that episode title probably better encapsulates what this show is all about better than I ever could. But I’m going to try anyway! 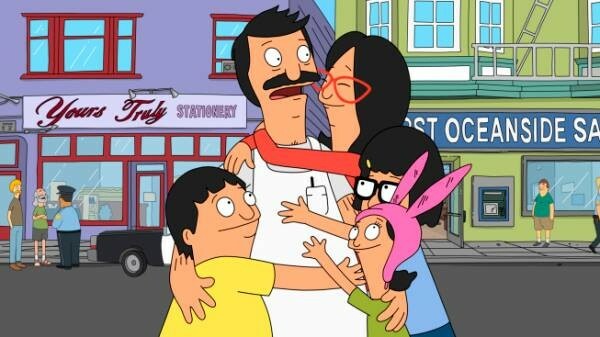 Bob’s Burgers is a comedy that revolves around the endearing Belcher clan: loving parents Bob (H. Jon Benjamin) and Linda (John Roberts); Tina (Dan Mintz) the awkward teen; Gene (Eugene Mirman) the dense-but-funny middle child; and Louise (Kristen Schall), the ringleader. The show is dense with jokes–throwing them at us rapid-fire and providing plenty of background sight gags–while also being full of heart. And while the jokes are great, it’s the heart in the show that makes it so special. You see, the Belcher family members genuinely love and care for one another. Much like Parks and Rec and Brooklyn 99, the primary motivation for the Belchers is love. How many sitcoms rely on the tired trope where the main character is a beleaguered and put-upon father, who has a nagging but hot wife? Too many. Bob’s Burgers isn’t like that. Do the characters get annoyed with each other? Yes, but hey, that’s how family works. At the end of the day, Bob and Linda and Tina and Gene and Louise are out to help each other. This simple fact really brings the show to life. Let’s look at two episodes from this season to back this idea up, specifically “The Equestranauts” and “The Kids Run Away.” In “The Equestranauts” Tina goes to a convention for her favorite show about ponies, only to find her subculture is dominated by adult men. When one of these men trick her into trading her favorite toy away (turns out it’s a valuable collectible), the entire family rallies around her to get it back. 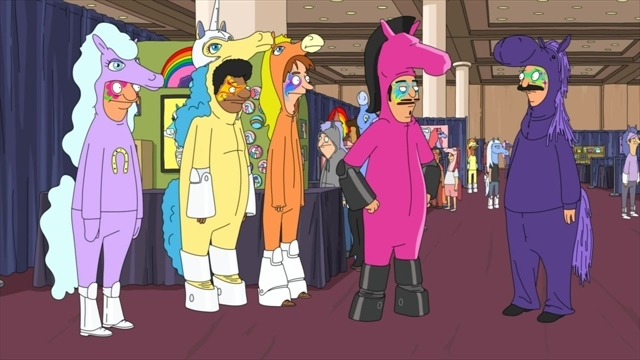 Bob dedicates himself to learning everything about his daughter’s favorite TV show in order to infiltrate the “equestical” (as the male fans call themselves) group and get the horse back. He even risks a back tattoo in order to reclaim Tina’s most prized possession. In “The Kids Run Away” it’s Louise, the youngest, who is in need of support. Bunny-hat-wearing Louise is a schemer, planning train heists and get-rich-quick capers that inevitably draw in her friends and siblings. When she shows real emotion it tends to be anger or hate. But in “The Kids Run Away” Louise is forced to face a major fear: she gets a cavity and it has to be filled. But rather than deal with it, she literally runs away to her aunt Gayle’s (Megan Mullally). Bob and Linda know she has to get the tooth fixed, so they make a bet with her: if she can last the weekend at Gayle’s she won’t have to get the tooth filled. This bet works within the show’s logic. We have been taught time and again that this is how you work with Louise. In order to get her to do what you want, you have to circumvent the emotional undercurrents. The thing is, Gayle is kind of a joke. So much so, that staying at her apartment for a whole weekend is almost unbearable. For the entire show, Gayle has been a pathetic character and a punchline: She’s a single older woman with too many cats, with terrible poetry and paintings, and is incapable of setting her life straight. 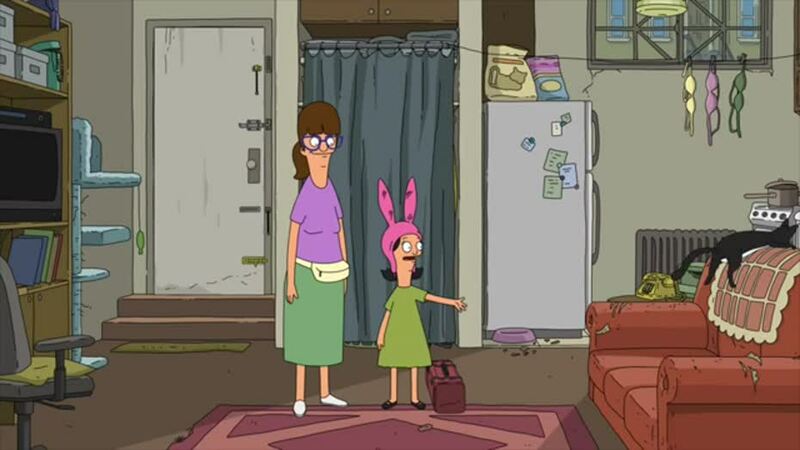 So it’s a surprise when Louise (and Tina and Gene) last the whole weekend. Her parents then resort to tricks. They convince her to eat ice cream, causing Louise a lot of pain. This still doesn’t convince her that she needs to see the dentist, though. And here’s where the show gets great: Gayle confronts Louise and gets her to admit she’s scared, and that she needs help. And then it’s Gayle who provides a solution tailor-made for Louise: The whole family pretends that filling the cavity will save the world, complete with hairdryers for guns and a fight scene encompassing the dentist’s office. Not only does Louise get the support she needs from her family, but both her and Gayle get moments that build their characters. Louise displays vulnerability and Gayle is an effective authority. To be honest, this season did not start out strong. The first episode, “A River Runs Through Bob,” is forgettable. Luckily, things pick up with Episode Two, “Fort Night,” a Halloween-themed episode that sees the Belcher kids and their friends (including Darryl, voiced by Aziz Ansari) trapped in a cardboard box fort and unable to trick or treat. The episodes after that are lukewarm, at best. 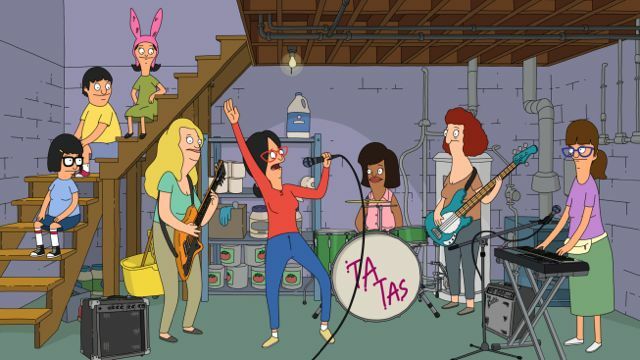 The season really starts to shine with “Purple Rain-Union,” in which Linda and her high school band (The Ta-Tas) get a chance to redeem themselves at their high school reunion. There are original songs and leg warmers and so many scrunchies. It’s pretty great. From there the season takes off, and though there are some misses (both “Uncle Teddy” and “I Get Psy-chic Out of You” come to mind) the hits totally make up for them. “Slumber Party,” “Mazel-Tina,” “The Kids Rob a Train,” and “Ambergris” are all solid episodes, as are the ones I referenced above. This season provided dedicated space for characters to grow. Louise showed vulnerability and Gayle, authority, yes, but others have been fleshed out, too: Mr. Fischoeder, their wealthy one-eyed landlord (voiced by Kevin Kline) now has a duplicitous brother, Felix (voiced by Zach Galifianakis); Mr. Frond perhaps has a better understanding of the Belcher kids and they of him; Bob is able to show sympathy toward his most hated rival, Jimmy Pesto; and Tina finally gets a real date and the returned affections of her long time crush, Jimmy, Jr. Tina started out on the show as an awkward, sexually frustrated preteen, and while she may still be awkward and sexually frustrated (boy, does she love butts) she also seems more comfortable in her skin throughout this season, more assertive and vocal and active in her own story. 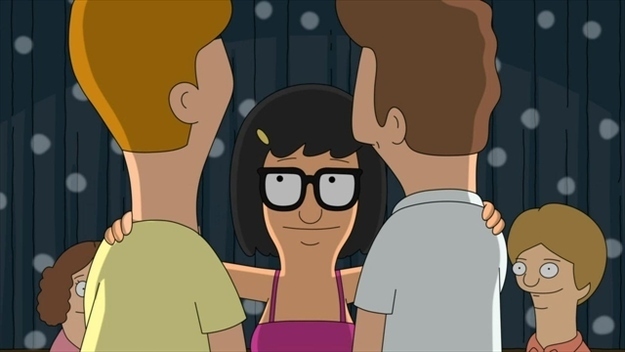 Tina is my favorite character on this show and, I’d argue, one of the top ten best characters to be invented in the past decade. While the episodes that revolve tightly around the Belcher family are the backbone of the show, this season has put a ton of effort into breathing life into the quirky community this family lives within. All of this is paid off in part one of the two-part season finale, “Wharf Horse,” in which Felix Fischoeder conspires to sell Wonder Wharf, a seedy amusement park owned by both Fischoeder brothers. Hooked by the prospect of owning a fancy burger bistro that caters to rich condo owners, Bob agrees to convince Mr. Fischoeder to sell. At the same time, Tina chains herself to Mr. Goiter, her favorite merry-go-round horse, in protest at the merry-go-round’s demolition. It’s a fun episode with a silly, yet very catchy, musical interlude, and a cliffhanger of an ending that I can’t wait to see resolved on Sunday. Season four has been a satisfying watch, even the more shallow episodes have had solid jokes. Luckily, Bob’s Burgers has been picked up for a fifth season already, which means more people have noticed the heart in this show and are willing to let it beat for a little while longer. Tomorrow we’ll have part two of this review, in which I share two Bob’s Burgers-themed burger recipes, The Onion Ring Around the Rosemary Burger and the Hummus a Tune Burger.